I received an e-mail Tuesday from a homeowner asking why there are a large number of flies buzzing around their magnolia. I sent them a picture of Magnolia Scale (Neolecanium cornuparvum) and told them to look for this insect on the twigs and branches. They replied that they had seen the scale, but thought it was a normal part of the tree. Sneaky scales! Magnolia scale is a type of "soft scale" so named because of the helmet-like soft leathery covering that protects the females. Although it's one of the largest soft scales in Ohio with mature females measuring as much as 1/2" in diameter, the pinkish-tan colored females are still somewhat flattened; they're continuing to "puff up" for the season. A casual observer may mistake them for a normal part of the tree. You may be wondering why I didn't consider that a dead animal was drawing the flies? This was the fourth e-mail I've received reporting flies buzzing magnolias; that would be a scary and weirdly large number of dead animals under magnolia trees. Besides, my neighbor's star magnolias (Magnolia stellate) are heavily infested with magnolia scale and are buzzing with bees, wasps, and flies. In fact, a high percentage of the flies are members of the blow fly family, Calliphoridae. Their maggots may have a taste for decaying flesh, but the adults like sweets. Magnolia scale females insert their piercing-sucking mouthparts into phloem vessels to tap plant sap. They extract amino acids to build proteins and carbohydrates to provide energy. However, there is a substantially larger quantity of dissolved carbohydrates in the sap compared to amino acids. This means the scale must remove a large amount of the sugary sap to extract the small amount of amino acids. They discharge the excess sugar-rich sap in the form of a sticky, sugary fluid called "honeydew." 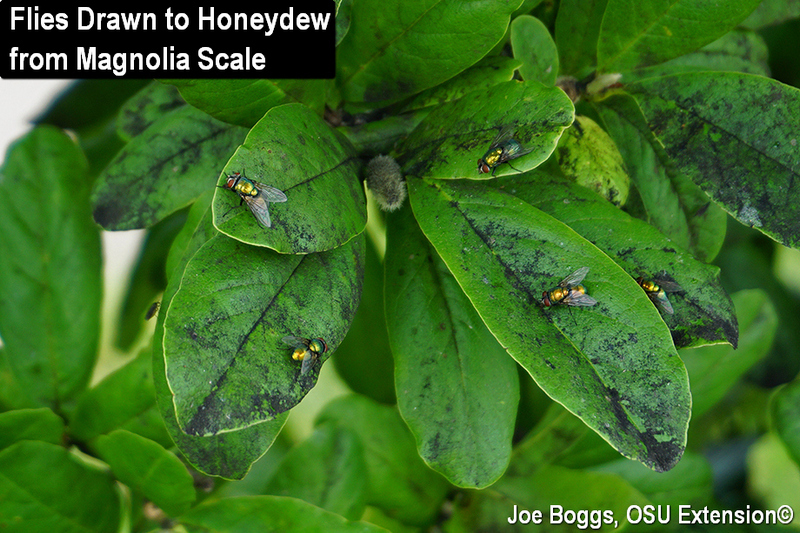 Magnolia scale is a prolific honeydew producer. The sticky honeydew may drip onto the leaves and stems of the host plant as well as plants beneath an infested tree, or onto sidewalks, cars, slow-moving entomologists, etc. The sweet liquid attracts a plethora of freeloading sugar-sippers including bees, wasps, ants, and flies. The honeydew is commonly colonized by black sooty molds and while the molds do not harm plants, the sticky goo combined with the molds can produce an aesthetically unappealing mess. Of course, the occurrence of honeydew and sooty molds do not necessarily mean a soft scale is afoot. Many other sucking insects (aphids, planthoppers, etc.) also exude honeydew. However, I've never seen aphids on magnolias, but magnolia scale populations seem to be on the rise in southwest Ohio. Unfortunately, there is little that can be done right now to suppress magnolia scale populations other than physical removal. If trees are small and scale populations are low, a dish scrubber or bathroom scrub brush can be used to physically remove the females before they produce eggs at the end of summer.